My GOD! It’s 2010 already and it’s been about six months since I’ve been comprehensively online apart from the odd day in the library and at two quid for an hour they were few and far between. So what’s new Al? Well the biggest and most important thing is of course that I am now married to the most wonderful lady in the world my darling Karen and I can thoroughly recommend married life. The wedding day itself was perfect and I have to put on record here a great big word of thanks to my best man BIG JOHN THOMPSON he did me proud got me to the registry office on time and embarrassed me big style in his speech. Thanks also to all our brilliant friends and families who came along laden with good food for the shared wedding breakfast, to TRYCKSTER who played the best music ever to come out of Cumbria and it’s something they sadly don’t do much of anymore, to ANGELA who led us all in a circle dance that was for me the best fun of the night and finally to SUNNY who performed the ceremony that handfasted Karen and I in front of all our great extended family of those we love. When I find where Karen has put the CD I’ll get some pictures up here. I must think mention the other band that played as it will lead to the next thing I want to say. They were THE BIG DISH OF CHEESE (formally known as WIZARDMARRAS BIG DISH OF CHEESE which give you a clue to one of the members) our prior and first gig was closing the proceedings on the Drystone Stage at last year’s Solfest and was the biggest laugh, surprisingly we got an awful lot of nice things said about us and we will be doing the same again this year. The wedding gig was slightly more drunken than that (I recall vaguely drinking something like Lambrini straight out of a jug) and surprisingly the song that went down the best was Wills evil piece of work “SLUTBITCH” a hideous piece of writing that has nothing to recommend it all, but Will is a true and rare poet who manages to say the most obscene and disgusting things in song and lift them from the sewer raising them to the level of inspired comedy genius. I cannot lay such claims to the potty mouthed rap I lay over the top of the instrumental breaks while not (even though I say it myself) playing some thick and funky harmonica. While performing this it was an absolute blast seeing lots of people dancing in front of us. The band was formed through us getting together at my regular Open Mic session at The Spinners Arms in Carlisle, which brings me on to what I want to say next for that aforementioned session is changing. 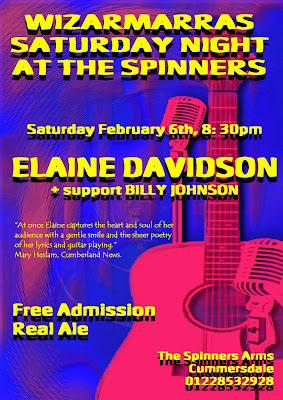 Supporting Elaine will be the much loved local singer BILLY JOHNSON.